A December 10 article by Eric Hoover in The Chronicle of Higher Education (“The Verification Trap“) prompted the search for this Link of the Week selection. How, one wondered, did colleges and universities explain “verification”? How simple, how easy might it be made for people who were not familiar with the term and process? Today’s Link selection surfaced after a search for “FAFSA verification on university website” and “FAFSA verification on college website.” I went 8 pages deep on the university search and 4 pages deep on the college search. Many of the same schools appeared in each search. Overall: Many, maybe most, sites visited took people immediately into the details of the forms and process on dense pages that required unusual diligence to follow. In other words, not very web-friendly. I’d especially not blame anyone experiencing verification for the first time to be unsettled about what awaited them. The writing style here is refreshingly free of the bureaucratic language often found on financial aid pages. The content presentation is relatively easy to scan thanks to a decent font size and nice white space not only between paragraphs but also between sentences within paragraphs. The site earned a “Good” rating from Google Test My site for a 5 second mobile download speed. Google projects a 19 percent visitor loss rate. 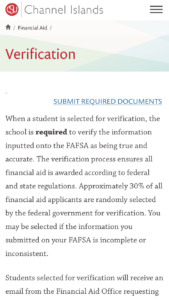 Compare the opening content, language, and presentation style of your FAFSA verification page to the Link of the Week at Cal State Channel Islands when you visit the “Verification” page. Join 571 people on the Top Tasks: Higher Education Website Content group on LinkedIn. Request membership here. The holiday break for Christmas and New Year’s is upon us. Expect the next “Your Monthly Higher Education Newsletter” about January 8 and the next Link of the Week email the following Monday. Until then… a Happy Holiday and Happy New Year to everyone.